CURT front mount trailer hitches allow you to use the front end of your vehicle for various towing applications. They can be used for mounting a winch, a snow plow, a number of hitch-mounted accessories and can even be used for some towing applications. When space is limited, a front mount hitch is commonly used to hold a cargo carrier, freeing up space inside the vehicle for extra cargo and making the rear mount receiver available to pull a trailer. At the boat ramp, your boat trailer can be hitched up to the front mount receiver, giving you better control over the trailer as you launch. Some of the other accessories that can be used with a front mount hitch are the CURT step pad, license plate holder, spare tire mount and skid shield. A front mount hitch bolts onto the underside of the vehicle frame just like a rear mount hitch; only, it is placed in the front of the vehicle, providing a useful receiver tube to accept a 2" x 2" shank. They are commonly used on trucks, vans and SUVs. 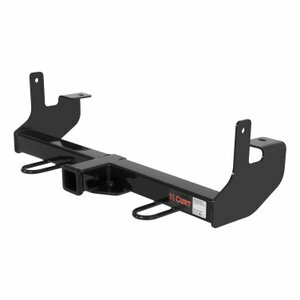 This CURT front mount trailer hitch features a gross trailer weight capacity of 5,000 lbs. and a tongue weight capacity of 500 lbs. It is designed to be a custom-fit trailer hitch for certain years of the 2010-Chevrolet Colorado Z71 with front stabilizer bar or 2010-2012 GMC Canyon Z71 with front stabilizer bar (to verify your vehicle compatibility, see the CURT application guide at curtmfg.com). It comes with all necessary hardware for a complete installation. At CURT, we do not see our front mount hitches as a backburner item to our rear mount hitches. We back them up with a one-year finish warranty and limited lifetime warranty to give you peace of mind on and off the road.